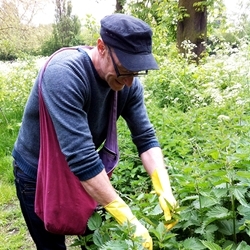 John Rensten, is one of the country's most enthusiastic and knowledgeable urban foragers. Formerly the co-owner of a successful gastro-pub in Clerkenwell he combined a love foraging with enthusiasm for running a busy eatery. Now he has set up Forage London to give city dwellers a chance to enjoy and discover some of the amazing wild foods that grow all around us.